1 runs the break lined up with an elbow. 2 & 3 run wide lanes. 4 sprints and tries to seal under basket for 1st option - can receive pass from either 1 2 or 3 (depending on where defender is positioned). If there is no option to 4 for quick entry - 4 goes ball side. 4 screens 2 2nd option. 5 looks to feed 2 on flex cut under the basket or 4 on the open up. 1 down screens for 4 3rd option. 5 looks to feed 1 on the open up & 4 coming off the screen. 1 then clears to 3 pt line for spacing. 5 will then pass to 4 to start offense again. 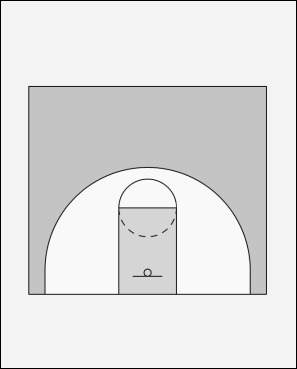 Offense is now reset on the opposite side of floor and is repeated until open shot is found.